This odd little island with its divided territory was to be a major turning point in my life, but that’s me putting the mizzen before the main, which would be a complete sloop up. We spent a couple of days on the French side but soon found out, thanks to a radio net on channel 14, that the Dutch side was more of the yachting centre than the French side. 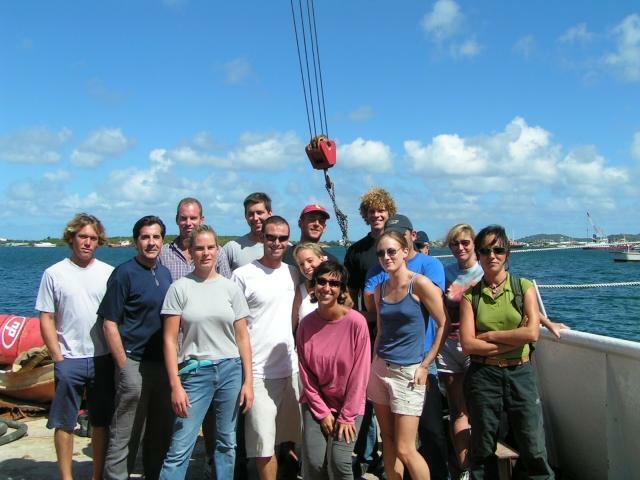 So… leaving the clear calm anchorage of Marigot Bay, we sailed around to the Dutch side and entered the lagoon, the bridge closing behind us like a steel prison door. We didn’t get far as we ran aground. Two minutes and a hundred horse power later and we were once again on our way to find a parking bay. We must have arrived on a Saturday for the next day was a boat jumble held at one of the local shore side restaurants. While there, we were informed that there was an STCW’95 course being held the next day. This course is a necessity for anyone wanting to work in the mega yacht industry and I thought it was a good ‘next step’. The problem however was that the courses are booked in advance and there were no vacancies, the next course being held the following month. Monday morning we, that is dad and I, went to the sailing school to see if they had any spaces left. The woman in charge of the courses scared me when I first saw her. I felt like a six year old child confronted by the principle in one of the schools dark corridors and when dad offended her by incorrectly guessing her nationality I was about to do a 180 and run for it. Everything went smoothly after that and although there was no space for me we asked her to please call us on the VHF if someone didn’t show up. An hour later I received a call that started a chain of events that would change my life forever. 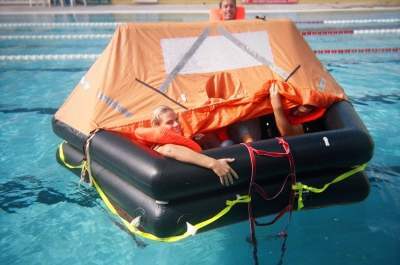 The STCW’95 course was divided into four parts spread over a five-day period. The first two days was spent studying, practicing and taking an exam on First aid. I was able to help the teacher with some demonstrations as I had just completed my Rescue Diver course and still had everything fresh in my memory. Taking this into account there was still a vast amount of new ground, which I had not covered because of its irrelevance to diving in Europe. The use of an AED an Automatic External Defibrillator was something that I had not covered, as it is illegal to operate one in Europe unless specifically trained. An AED is something like a battery pack with two pads called paddles connected to it by cables. When normal heart rhythm is interrupted and becomes uneven it is sometimes necessary to administer a shock interrupting the irregular heartbeat and restoring it to its normal rhythm. It gets rather complicated as there are shock able and un-shock able rhythms not to mention procedures to use the AED but that just makes things complicated and this is an account of my experiences not a first aid course so I will stop with the amount of detail given. Personal safety and social responsibility which, cover what should be done in the event of an emergency on board. This along with Personal Survival Techniques tries to give students a well balanced look at what happens in an emergency and how, including stress and panic into the situations can have disastrous effects. For me, the highlight of the course was the section on Marine Fire Fighting. During the classroom sessions we had a chance to don BA’s or Breathing Apparatus. The sessions in the classroom dealt with different types of extinguishing agents and the types of fires or ‘Fire class’s’. During the practical drill we had to locate a ‘victim’ that was trapped inside an abandoned tugboat. For that we needed BA’s, Fire retardant clothing, teamwork and an abandoned tug. Luckily for us, there just happened to be an abandoned tug not too far from the school. The drill consisted of kiting up in full fire fighting gear complete with a ‘smoke’ mask. The mask was to simulate a smoke filled room. A team then entered the tug and had to find the victim, a thirty-kilo doll with a radio voice box shouting for help. The team make there way towards the sound maintaining body contact and touching the walls and accounting for objects passed. Taking note of any unusual shapes and objects helps maintain orientation and aids in an ‘evacuation’. 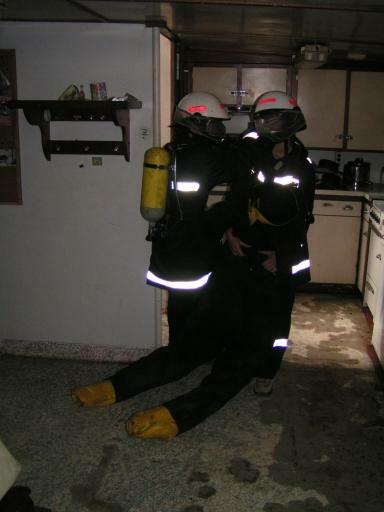 Once the victim is located one of the team lifts it in a fire-mans carry and, walking backwards is lead to safety by the other member of the team. After completing my STCW’95 course I soon slipped back into my old routine of exercise, reading and eating.